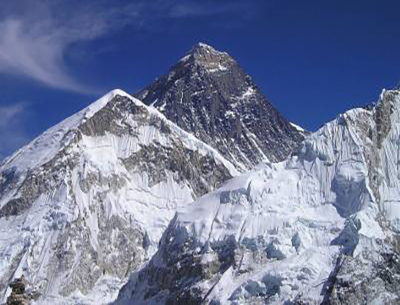 The Three Passes Trek of the Everest region is one of the most popular long-distance trekking journeys. The trek is one of the most adventurous escapades not only in Nepal but in the whole world. The region's diverse alpine and the trans-Himalayan landscape are beguilingly ornamented with deep river valleys, white rivers originating from the peaks and Sherpa villages where the Himalayan lifestyle is the norm for its people. All these aspects of the region are explored and admired in the length of the trek. Starting the trek from Lukla, the Three Passes Trek has trails that wind through the gorgeous terrain of the Khumbu. Including highlights like the commercial Himalayan towns of Namche Bazaar and Tengboche, the vantage points of Kalapatthar and the Gokyo RI as well as the three high Mountain Passes of the Khumbu- the Renjo La (5360m), the Cho La (5420m) and the Kongma La (5535m), the Three Passes Trek is a beautiful journey of amazing Himalayan views at every turn. Initially, the journey follows the same path as that of the Everest Base Camp Trek but diverts toward the villages of Thame to reach the holy Gokyo Lakes of the Himalayas. It is a journey full of the best aspects of the region. Due to the High Mountain Passes, the Three Passes Trek is a rather strenuous trekking journey. It requires more physical strength to complete than the average base camp treks of the region. Moreover, the best times to do the Three Passes Trek are during the spring and the autumn seasons. The spring season lasts from March to May and the autumn season lasts from the months of September to November. 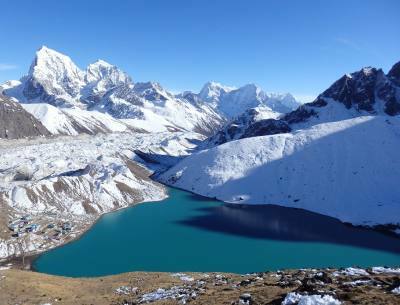 It is not suitable to do during the winter months as the mountain passes tend to be blocked because of heavy snow and the Gokyo Lake tends to freeze over in the dwindling temperatures. The Three Passes Trek by Destination Unlimited is the best package if its kind. It is a well-crafted package that includes all of the best features of the region. You will be in the company of our professional guides and throughout the journey- you will be provided the best available services. Our professional team has been involved in the field for many years. With us, you are guaranteed the best time of your life! You may arrive at the airport at any time. When you arrive, one of our company's airport representatives will be waiting for you when you do. You will be transferred to the Hotel for your check-in. Overnight stay at the Hotel in Kathmandu. Day 02: Sightseeing of Kathmandu Valley and Trek Preparation Day. This day, you will have a guided sightseeing tour of the UNESCO World Heritage Sites of the Kathmandu city. The tour includes visiting the Pashupatinath Temple, the Swayambhunath Stupa, the Boudhanath Temple and the Kathmandu Durbar Square. Each site is sacred in terms of the religious and historical context of the country. They are built in the unique Nepali architectural styles and provide insight into the cultural background of the country. After the tour, you will be transferred back to the Hotel. Overnight stay at the Hotel in Kathmandu. Day 03: Flight to Lukla (2840m) Trek to Phakding (2610m), 35 min flight, 4 Hrs trek. Early in the morning, you will be transferred to the airport for your Lukla flight. The short flight to Lukla will take you to the Khumbu. Upon landing at Lukla, you will trek to the village of Phakding. Phakding is a small village that caters to trekkers who often use it as an overnight stop. It has a beautiful view of the Kusum Khangkaru Peak (6367m). Overnight stay at the guesthouse at Phakding. Day 04: Trek from Phakding to Namche Bazaar (3445m), 5 to 6 Hrs trek. From Phakding, you will continue your journey, reaching the small settlement of Monjo. It is at Monjo where the entrance to the Sagarmatha National Park is located. You will enter the park and trek through its beautiful brimming woodlands towards the popular Himalayan town of Namche Bazaar. The town is a bustling commercial hub of the region. Overnight stay at the guesthouse at Namche Bazaar. This day is specially sanctioned for acclimatization. You can visit the Everest View Hotel today that is situated a few distances away from the town. The hotel presents views of the Everest peaks like Sagarmatha (8848m), Lhotse (8414m), Ama Dablam (6856m) and the Taboche (6367m) among others from all of its windows. 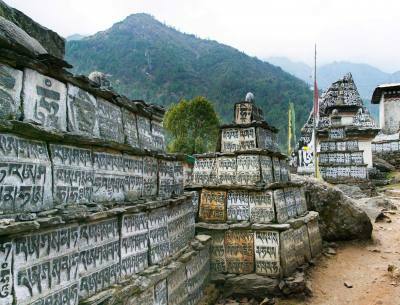 Back at Namche, you can also visit the Sherpa Culture Museum and the Everest Photo Gallery. Overnight stay at the guesthouse at Namche. Day 06: Trek from Namche Bazaar to Thame (3820m), 5 to 6 Hrs trek. From Namche Bazaar, you will trek alongside the Dudh Koshi. You will trek clockwise of the Everest Base Camp and follow the Bhote Koshi River valley towards the Nyangpala Pass. This pass is a traditional passageway between Tibet and Nepal. Winding your way along the track of juniper hamlets and blooming rhododendron trees, you will reach Thame. Overnight stay at the guesthouse at Thame. Day 07: Trek from Thame to Marlung (4210m), 5 to 6 Hrs trek. From Thame, you will make your way into the valley, going deeper through the woodlands to finally reach the small settlement of Marlung. The ebbing and turning trail is adorned with the views of peaks like Everest (8848m), the Pumori (7165m), Lhotse (8414m), Nuptse (7861m) and the Taboche (6367m) among many others. Along the way, you will also pass the Nangpa La Mountain Pass, a glaciated pass situated on the borders of Tibet and Nepal. Overnight stay at the guesthouse at Marlung. Day 08: Trek from Marlung to Lungden (4368m), 5 to 6 Hrs trek. From Marlung, you will coruscate along the jaded path towards Lungden today. Lungden is a small Sherpa settlement where dainty wooden houses line the street and thick groves of Himalayan pines covered in moss creates natural canopies overhead. You can experience the remote lifestyle of the people here who herd cattle and yaks in the serenity of the Himalayan crevasse. Overnight stay at a guesthouse at Lungden. Day 09: Trek from Lungden to Renjo La Pass (5360m) to Gokyo (4800m), 5 to 6 Hrs trek. Today, you will cross the first of the three major High Mountain Pass of the journey, the Renjo La. Making your way towards the Gokyo Lake, you will be passing through a rather strenuous terrain. You will also pass by the twin Renjo lakes from where the views of mountain peaks like Cho Oyu (8188m), Everest (8848m), Makalu (8463m) and Cholatse (6440m) are quite dramatic. Finally passing the Renjo La, you will move downwards towards the Gokyo lakes. Overnight stay at the guesthouse at Gokyo. Day 10: Rest day at Gokyo, hike to Gokyo Ri (5360m), 4 Hrs trip. Today is a day set aside for rest and respite. You can enjoy the serene Gokyo Lake today and take amazing pictures of the water body set against the backdrop of the cerulean peaks. From Gokyo, you will also make your way towards Gokyo Ri- another vantage point of the region beside Kalapatthar from where the views of peaks like Cholatse (6440m), the Lingtren (6749m), Everest (8848m), Nuptse (7861m), Lhotse (8414m), the Ama Dablam (6856m) and Mount Taboche (6367m) among many more are quite awe-inspiring. Overnight stay at the guesthouse at Gokyo. Day 11: Trek from Gokyo to Thaknak (4750m), 5 to 6 Hrs trek. Today is a rather easy day of trekking, From Gokyo, you will climb out of the village towards a ridge. Picking a route through the Ngozumpa Glacier, you will make your way towards the towering mountain on the other side. Traversing along the edge of the mountain, you will finally meander your way towards Thaknak. Overnight stay at the guesthouse at Thaknak. Day 12: Trek from Thaknak to Cho La to Dzongla (4830m), 7 to 8 Hrs, trek. Making your way through the steep terrain upwards, you will be trekking on a tough rocky trail towards the Cho La Mountain Pass (5420m). The mountain pass of Cho La is another impressive view of the journey from where the views of Everest (8848m) and its neighboring peaks are quite brilliant. After crossing the mountain pass, you will carefully make your way down, steeply descending down towards Dzongla. Overnight stay at the guesthouse at Dzongla. Day 13: Trek from Dzongla to Lobuche 4900m), 4 to 5 Hrs trek. After the mountain pass, today's trek is easy. Along your way towards Lobuche, you can further enjoy the glacial panoramas of the region. Crossing a bridge over the river, you will continue on your grassy trail towards Lobuche with the views of the Thamserku (6608m), Kangtega (6782m) and Taboche (6367m) keeping you company along the journey. Overnight stay at the guesthouse at Lobuche. Day 14: Trek Lobuche to Gorakshep (5170m) to EBC (5364m) and back to Gorakshep, 9 Hrs trek. From Lobuche, you will make your way towards Gorakshep. It is a small settlement that has a few lodges; it is also the last stop before the Everest base camp. From Gorakshep, you will steadily make your way towards the base camp of Everest from where you can see the views of the Khumbu Glacier and Icefall as well as the views of the Lingtren Peak (6749m). After spending time at the base camp, you will then trek back to Gorakshep. Overnight stay at the guesthouse at Gorakshep. Day 15: Hike to Kala Patthar (5550m) then to Lobuche (4900m), 6 to 8 Hrs trek. From Gorakshep, you will make your way towards Kalapatthar early in the morning before sunrise. Kalapatthar is a famous vantage point that presents panoramic views of the entire Mount Everest massif. The sunrise view amidst the Everest massifs seen from Kalapatthar is something that is extremely phenomenal; the rays of the sun sweep over the peaks quite dauntingly, like a cascade of luminous orange patina. After enjoying the sights at Kalapatthar, we will then make our way back towards Lobuche. Overnight stay at the guesthouse at Lobuche. Day 16: Trek from Lobuche to Kongma La (5,535m) to Chhukung (4,730m), 6 to 7 Hrs trek. From Lobuche, you will trek towards Chhukung today, crossing the Kongma La Mountain Pass. Initially, the path rises diagonally towards the southeast of the Khumbu Glacier moraine from where you can get amazing views of the Himalayas. After the ascent to the moraine, you will steadily make your way across the glacier towards Pokalde. From Pokalde, you will make a steady steep ascent towards the pass. It is a sharp climb and can be a demanding one, even for experienced climbers. Crossing the mountain pass, you will then slowly trek down again to Chhukung. Overnight stay at the guesthouse at Chhukung. Day 17: Trek from Chhukung to Tengboche (3860m), 5 to 6 Hrs trek. From Chhukung, you will make your way through the Imja River valley, following a beautiful trail towards the village of Tengboche. The village of Tengboche is situated at the confluence of the Imja Khola and the Dudh Koshi Rivers and offers great views of the Ama Dablam peak (6856m). Here, you can visit the Tengboche monastery as well. Overnight stay at the guesthouse at Tengboche. Day 18: Trek from Tengboche to Namche Bazaar, 5 to 6 Hrs trek. Trekking through the coruscating rail of the Dudh Koshi river valley, you will make your way back towards Namche Bazaar, with the sight of Everest (8848m), Kongde Ri (6187m), Taboche (6367m) and the Ama Dablam (6856m) peaks towering over the valley. You often meet Sherpa porters and donkeys as you make way to Namche through verdant hills. Overnight stay at the guesthouse at Namche Bazaar. Day 19: Trek from Namche Bazaar to Lukla, 6 to 7 Hrs trek. From Namche, you will meander your way back towards Lukla, passing by Monjo, Jorsalle, and Phakding. It is a beautiful trek back, and this time, you can look for the elusive sight of Red Panda and the Musk Deer as well while trekking through the naturally verdant woodlands of the Sagarmatha National park. Overnight stay at the guesthouse at Lukla. Day 20: Flight from Lukla to Kathmandu, 35 minutes. 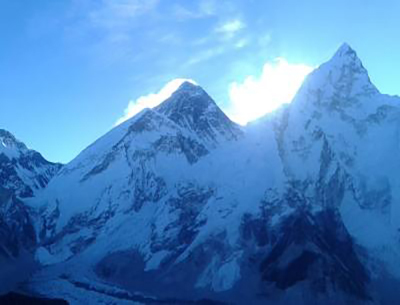 You will say goodbye to the Khumbu Mountains for the last time as you take your flight back to Kathmandu today. Upon landing back at the capital, you can spend the rest of the time as you please, resting your aching limbs or shopping last minute for any souvenirs that you might fancy. Overnight say at the Hotel in Kathmandu. You will be transferred back to the airport today, approximately three hours before your flight departure.